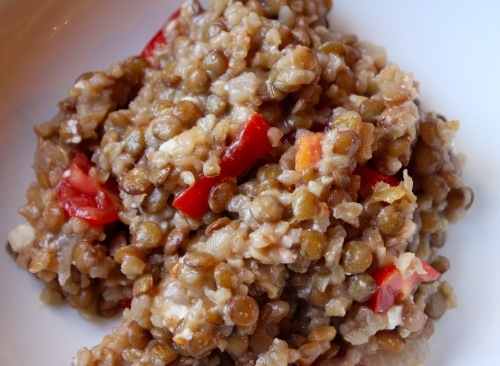 Rustic lentil salad makes a complete one dish meal. PB loves it, I love it, and it is healthy and balanced. I love that in one bowl we have a full meal that covers so many food groups and nutrient needs. It is a great recipe for those busy nights when no one feels like cooking, never mind cleaning a pile of dishes. Bulgur wheat is a main component of this recipe and can be found in the bulk food section of your market. Be sure to buy the smallest size bulgur they have. This dish really brings me back to my and my husband’s roots. As a woman with Italian and Jordanian heritage, lentils are a significant part of my natural diet. 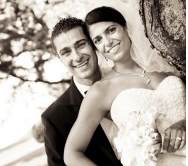 As an Armenian, PB grew up with both lentils and bulgur wheat and loves both. I love dry lentils and other beans because they are healthy, inexpensive, last a long time, and don’t take up space in the cabinet. Join me over the next two weeks as I share both new and old favorite dry lentil and pea recipes as part of my participation in the USA Dry Pea and Lentil Recipe Rivalry. I will focus on healthy dishes you can enjoy at home or bring to your next summer get together!!! Heat olive oil in a big pot over medium heat. Add the diced onion and cook for 15 minutes until the onions are translucent and almost brown. Add the cumin, hot red pepper, rinsed lentils and bulgur wheat and water and bring to a boil. After it comes to a boil bring the heat down and simmer for 30 minutes until the lentils and bulgur wheat are chewy yet slightly soft. Add the grape tomatoes and feta and mix until combined. Serve warm or cold, as you like. Enjoy! Can you tell I am on a salad kick? *Please note that this recipe was sponsored by USA Dry Peas, Lentils & Chickpeas. drool. This is my favorite kind of dinner. Love the addition of feta. I bet it melts into the mixture. I can’t wait for all of your peas/lentils/chickpea recipes! I recently made a vegetarian green pea soup and can’t wait to make it again. Healthy, delicious and inexpensive. How can you go wrong? I love how creamy it looks! Must be from the combination of olive oil and feta cheese. Tasty tasty. HOLY YUM. this sounds so incredible! do you think you could sub spelt berries for the bulghar wheat? @Heather (Heather’s Dish), Yes, definitely! Sounds delicious! (And healthy of course) It looks SO creamy too! There is a spicy lentil wrap that I love at Trader Joe’s and I know that it also has bulgar and cumin so I cannot wait to try this. What kind of lentils do you use? @Carolyn, Hi! I use green lentils, which are my favorite. Let me know what you think! @RhodeyGirlTests, Thanks! I am going to pick some up at Whole Foods this week and give it a try. YUM! I love lentils, although I am not sure why I do not eat them more! Thanks for this amazing recipe!! Thanks for the comment on my blog. Of all the blogger challenges, I think this is going to be my favorite because I really love lentils! Sounds like a delicious salad! I like the summer flavors you used. 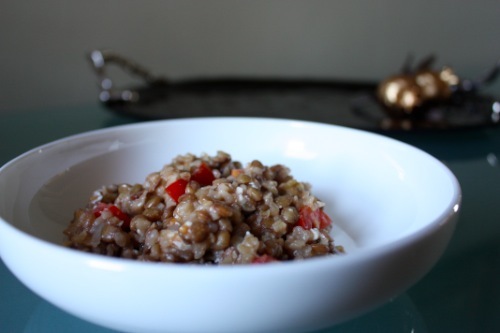 This is my favorite lentil recipe– I love the combination of lentils and bulgur! I’d make this all the time if I had a lifetime supply of lentils. What a beautiful lentil salad! I’d love to hear more about how to participate in the USA Dry Peas, Lentils & Chickpeas Recipe Rivalry! This was so flipping good. Only additions I made were some freshly chopped parsley and a good size glug of zinfandel vinegar (going to guess 2 TB). Seriously delicious and not one ounce of guilt. And holy leftovers. @To Kiss The Cook, Thank you! !